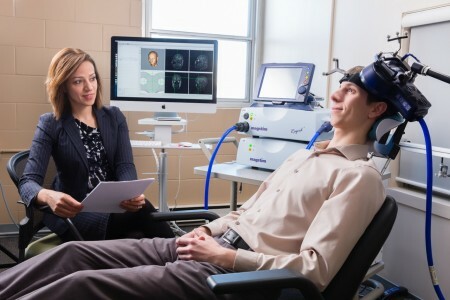 At the 2015 meeting of the Transcranial Magnetic Stimulation Society, Linda Carpenter, an American researcher who specializes in repeated transcranial magnetic stimulation (rTMS), a method of treating depression by using a magnetic coil placed near the scalp to stimulate neurons, compared notes with Jeff Daskalakis, a Canadian researcher who also studies rTMS. Carpenter described the limited approval rTMS enjoys in the US. RTMS has been approved by the Federal Drug Administration for the treatment of unipolar depression under very limited parameters (only at a frequency of 10Hz). RTMS has limited availability in the US, and many healthcare companies do not cover it. Providers face scrutiny of study recruitment practices and recordkeeping by insurers and the Joint Commission (formerly the Joint Commission of Accreditation of Healthcare Organizations), which assesses healthcare quality. In contrast, Daskalakis and his Canadian colleagues can and do use rTMS to treat a broader range of illnesses including bipolar disorder. In Canada rTMS is used to treat unipolar depression, schizophrenia, post-traumatic stress disorder (PTSD), and obsessive-compulsive disorder (OCD), and clinicians can adjust the parameters to treat adolescents and the elderly. The situation in the US is unfair. Because rTMS has not been approved for the treatment of bipolar disorder, Carpenter and other clinicians in the US are unable to treat bipolar depression even though a wide range of experts and published studies report that rTMS is as effective (or possibly even more so) for patients with bipolar depression than for those with unipolar depression. Few treatments are available for bipolar depression. The discrepancy is even sadder when one considers that there are already more than 20 FDA-approved antidepressants that can be used to treat unipolar depression, but only three approved medications for bipolar depression. Bipolar depression is an orphan illness, which lacks a powerful voice advocating for more treatment research about optimal therapeutic strategies. In 2013, the National Institute for Mental Health (NIMH) launched a new initiative known as Research Domain Criteria (RDoC), in the hopes of adjusting the framework for research on mental disorders to incorporate genetics, imaging, and other data into the diagnosis and description of illnesses, as opposed to an earlier system that relied mainly on behavioral reports. One concern about this change at the NIMH, which funds much of the research that leads to Federal Drug Administration-approved treatments, is that clinical treatment studies to collect data on particular illnesses or in particular populations (e.g. bipolar illness in children) could lose out to studies focused on the collection of data on a broad range of symptoms involved in a spectrum of illnesses, particularly studies of biomarkers, or biological measurements that indicate the presence of an illness. This change may make it difficult for researchers to find funding for the collection of data about therapeutics for specific illnesses like bipolar disorder, limiting the already sparse funding for the study of bipolar disorder in children and adults. Bipolar disorder is a complicated illness that can differ from one person to the next, and may include depression, hypomania, mania, mixed states, rapid cycling, comorbid anxiety or substance abuse disorders, and cognitive impairment. This diversity of presentation may make new drug exploration under the new framework even more tenuous for patients with bipolar disorder.